I like to think of myself as a happy person. I try to find the humor in everything, or at the very least, the silver lining. I always look for the best in everyone and embrace obstacles as learning experiences. HOW-FREAKING-EVER, lately, my toddler's antics are making all the above so damn difficult! I always say there is an ebb and flow to toddlers. My child will go days, sometimes weeks, being a perfect little angel. Sure, he does crazy stuff, but it's usually not so bad during his good-boy run. 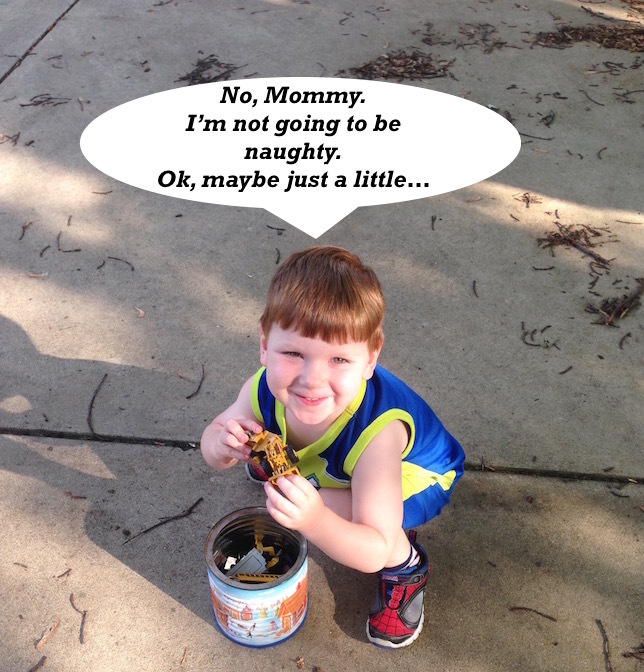 But when he is in the crazy-toddler phase, finding the humor in the things he does is impossible! I don't know what's gotten into my toddler. Maybe the summer heat is getting to him. Maybe the growing pains are driving him mad, whatever it is, the kid is behaving like rules do not apply. For starters, he has been so defiant lately, it's unreal. If I say, "No, don't do that!" He can't do it fast enough! It's so bad, I catch myself saying NO!, and instantly know I've pretty much told him, GO FOR IT, Buddy! I totally feel like cleaning up your mess! OMG! You know how I talked a while ago about him watching Russian YouTube? And how he started saying Russian words, or at least words with the same sounds? Well, get this. He cusses in Russian when he's mad. It's SO WRONG. He says a bad word, then adds something Russian sounding on the end. Words like, "Dammitdevoshka!" or " OH, Shitdevsheka!" Of course, FTD and I are like, Um, dude, we know you're saying bad words, adding some Russian nonsense on the end isn't working. No. Wait, it gets worse... When I told my kid, "The world is your oyster," he heard, "The world is your Toilet." If we are outside, in the backyard, the park, the zoo... The kid will whip his little fire hose out and announce he has to pee, then does it! FYI: You let your kid pee in the backyard ONE TIME, and he thinks peeing outside is the greatest thing, EVER! I'm going to have to thank FTD for this one. I suppose I should be happy he didn't let Ollie crap in the backyard. Yet. 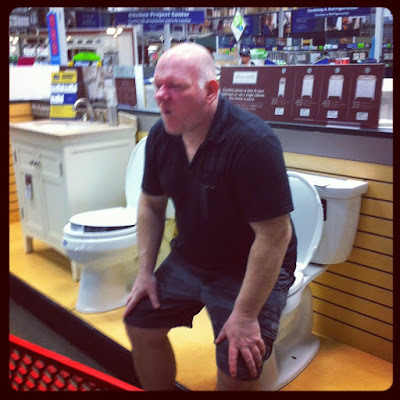 Remember when FTD was, "Teaching Ollie to take a dump in the dunny" AT THE HARDWARE STORE? Yeah, the man lives for a laugh. Especially potty humor induced laughs. Then there is the clingy mommy-hold-me craziness going on. It's like he's reverted to being 8-months old with raging separation anxiety. Sometimes, I have to hold him in the house for no reason other than, "Mommy, hold me. Please." And just when I think we have escaped the biting and hitting phase, he hits his cousin! I thought I was going to die. Sure, he swats at me, but he has never hit or bitten another child. Until last weekend, when his four cousins, all boys, were over. Out of nowhere he hit the youngest one, then threw a toy at the oldest one! It was so bad, when time-outs and making him apologize ceased to work, FTD had to take him the bed well before everyone left. And to top it all off, his Child's Day Out program at the church is closed for two weeks, and his new school doesn't start until August 25th! I'm fairly certain I'm not going to survive. My toddler would choose his summer break to turn into a crazy person. I'm so sick of having to constantly stay on him! I feel like such an A-hole Parent. Between the defiance, Russian cussing, toy throwing, hitting and park peeing, I'm scared for what's next! Because every parent of a toddler knows, just when you think it can't get any worse, the little evil genius proves you wrong.